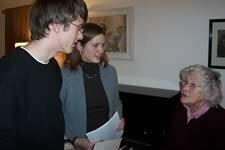 On January 22, 2006, Gustin House presented a Saskatoon Centennial Recital featuring Timothy Steeves, piano and Nancy Dahn, violin. Timothy performed four piano solo works, and in the second half of the program he and Nancy appeared as "Duo Concertante." The evening was a splendid musical beginning to the centenary of the city Lyell Gustin chose as his lifetime home, and which honoured him as "an outstanding musician, teacher, and leader [who] has made a very great contribution to the musical life of this community and of the nation" (City of Saskatoon Award for Distinguished Public Service, April 1972). This Recital was dedicated to another worthy Saskatoon citizen, the late Lloyd Rodwell, in appreciation for his commitment to preserving the Gustin House and the Gustin musical legacy. Following is the poster, and below that, the program for the recital. On Monday, February 13, the Gustin/Trounce Heritage Committee Inc. received a 2006 City of Saskatoon Heritage Award for the interior/exterior restoration of Gustin House. The citation noted that the restoration work was based on aspects such as historic photo documentation, that it included careful efforts to replicate original paint colours, and that the Gustin furnishings and artifacts were returned to their original places in the House. Walter Thiessen, president, accepted the Award on behalf of the Committee. Also recognized for their work on Gustin House were Allan Duddridge of Stantec Architecture Ltd., Harry Dalsgaard of D2 Construction, and Renee Duddridge of Duddridge Interior Design, all of Saskatoon. In attendance at the ceremony were others from the architectural firm and the construction company, as well as family members and friends of the Committee. At a reception at Frances Morrison Library following the Award Ceremony, photos of Gustin House and of the all the winning heritage entries were on display. After the months of intense work during 2005 by Gustin/Trounce Heritage Committee members, this recognition was an honour and a joy! Thank you to those whose excellent professional services made the fine restoration of Gustin House possible, and to others who have assisted in so many ways. Inspired by Lyell Gustin's ideal of the unity of the fine arts, an evening highlighting the works of a Saskatoon violinist-composer and two visual artists was held at Gustin House on Sunday evening, February 26. Michael Swan, concertmaster of the Saskatoon Symphony orchestra for nearly 22 years, performed three of his own compositions for unaccompanied violin, commenting on the ideas which shaped each piece. 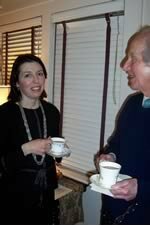 Showing representative paintings, Catherine Perehudoff Fowler, discussed her relationship with the landscape as expressed in her art; and Degen Lindner spoke about realism and abstraction in her work. 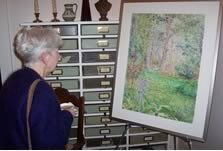 Ms. Lindner--whose artist-father Ernest Lindner was a friend and colleague of Lyell Gustin--and Ms. Perehudoff Fowler, daughter of painters Dorothy Knowles and William Perehudoff, recounted their family experiences of the artistic life and also shared childhood recollections of Dr. Gustin. Gregory Schulte brought the program to a close with a premiere of several piano compositions by Mr. Swan. Michael Swan, Vasil and Anastasia Szalasznyj. Rosa Gebhardt and Degen Lindner exchange thoughts on art. Margaret Steeves views a work by Cathereine Perehudoff Fowler. 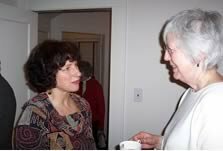 Karen Sterner and Victoria Neufeldt. 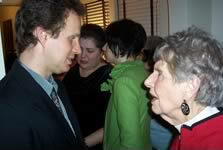 Michael Swan visits with Lillian Thompson; in the background, Kathy and Anastasia Szalasznyj. Henry Kloppenburg and Hugh McKee. During his career as a piano teacher, Lyell Gustin often arranged musical events highlighting composers in their significant years and on special anniversaries. Gustin House, joining with the musical world in marking 2006 as the 250th anniversary of the birth of Wolfgang Amadeus Mozart, presented an evening program celebrating the words and works of Mozart. Henry Woolf, Saskatoon's "dean of the stage," read selected Mozart letters written between 1770 and late 1791 to family members and friends. Pianist Zsuzsanna Takáts, a graduate of the Franz Lizst Academy in Budapest, and Gregory Schulte, a Gustin graduate, performed one of Mozart's sonatas for piano, four hands; Mr. Schulte performed a set of variations; and Carissa Klopoushak, Principal Second Violin of the Saskatoon Symphony Orchestra, joined Mr. Schulte in a sonata for piano and violin. Both music and letters richly revealed the warmth and humour, the love of life, and the creative brilliance of one of the greatest composers the world has known. 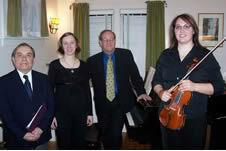 The artists of the Mozart evening left to right: Henry Wolf, Zsuzsunna Takats, Gregory Schulte and Carissa Klopoushak. 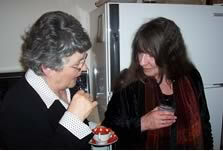 Margaret Kippen and Mary Friesen; in the background, Louise Schulte and Ilse Guenther. 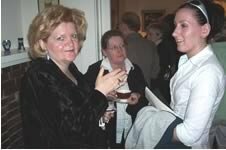 Jeanette Schuler, Colleen Hill of Kerrobert and Crystal Hill gather in the front studio; in the background, Robert and Lura Mae Sider. 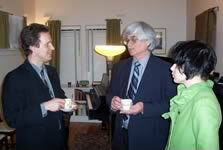 Norma Stewart and Wayne Chappell visit with Henry Wolf. 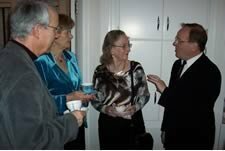 Gregory Schulte shares a Mozart anecdote with Bob and Doreen Hickie. Glen and Maidrid Jonat with Ilse Guenther, departing Gustin House. 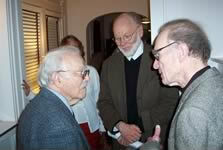 May 31, 2006, marked the 111th anniversary of Lyell Gustin's birth in Fitch Bay, QC. That afternoon, on the occasion of the installation of a memorial stone at Dr. Gustin's burial place, a Service of Dedication was held at 2:00 p.m., Woodlawn Cemetery, Saskatoon. The Rt. Rev. Thomas O. Morgan, retired Bishop of Saskatoon, conducted the service. Walter Thiessen read a tribute to Lyell Gustin, written by Dr. Joan Halmo; and a brass ensemble performed at the opening and closing of the service. Gathered in the afternoon light of a splendid spring day were a number of Gustin graduates and friends, as well as a great-niece of Lyell Gustin--Provie Gray, with her husband George, of Langham, SK. Following the service, a reception was held at Gustin House. The granite memorial stone is the gift of Boyd McDonald, Gustin graduate and Professor Emeritus at Wilfrid Laurier University, Waterloo, ON; Mr. McDonald was in attendance for the service of dedication. The Gustin/Trounce Heritage Committee has invited artists¹ designs for a bronze medallion in the likeness of Lyell Gustin which will be mounted on the memorial stone. Anyone wishing to contribute toward the medallion may contact Walter Thiessen at (306) 373-9103. The brass ensemble at the Service of Dedication left to right: Edith Gruber, Don Schmidt, and Natalie DeJong. 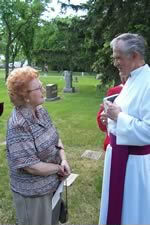 Jeanne Walter talks with Bishop Thomas Morgan. 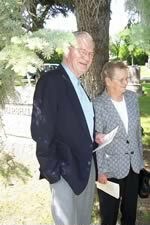 George and Provie Gray of Langham, SK; Mrs. Gray is a great-niece of Lyell Gustin. A reunion of Gustin Studio graduates who studied together: Ewan Coxworth, Walter Thiessen and Boyd MacDonald. Studio graduates Mary Barrett Lenz, Boyd MacDonald, and Mary Friesen. John Lenz and two members of the Gustin/Trounce heritage Committee, Lynda Finnimore and Joan Halmo. At Gustin House after the service, Walter Falk tries the piano where he once studied. At Gustin House after the service, flowers by the Nosegay Flowershop. A recital featuring Gustin Studio graduates, descendants and colleagues was held at St. John's Anglican Cathedral, Saskatoon, on June 1. The evening of "Music and Memories from the Lyell Gustin Studios" featured former Gustin students--Ewen Coxworth, Boyd McDonald, and Gregory Schulte--along with Ross Carstairs, flute; Geoff Cole, viola; Jordie Hughton, baritone; and Margaret Wilson, clarinet. The Gustin graduates each spoke briefly about the experience and influence of the Gustin Studios in their lives and work. Mr. Schulte, who performed in several ensembles at the recital, described his memory of coming to lessons in the Gustin Studios as entering the "Holy of Holies." Commenting on his original piano compositions, Ewen Coxworth recalled that Dr.Gustin had encouraged him to compose in his student days. Mr. McDonald, who performed works by Mozart and Brahms which he had just played in recital in Bayreuth, Germany (April 2006), noted that Brahms was a favourite composer of Mr. Gustin. The program appears below. On June 10, 2006, the Gustin/Trounce Heritage Committee Inc. received a Saskatchewan Architectural Heritage Society Excellence Award for the restoration of Gustin House. Her Honour, the Honourable Dr. Lynda M. Haverstock , Lieutenant Governor of Saskatchewan, made the presentation in a ceremony at Convocation Hall, University of Saskatchewan; Saskatoon; Dr. Joan Halmo accepted the award on behalf of the Committee. Also recognized in the Award were Stantec Architecture, represented at the event by Allan Duddridge, principal architect; and D2 Construction, represented by Harry Dalsgaard, manager. Thank you to the fine professionals and to all who have contributed in any way to the wonderful success of the Gustin House restoration! The handsome framed certificate for this provincial award is on display at Gustin House, where it joins a City of Saskatoon Heritage Award received by the Committee in February 2006 as well as the City of Saskatoon Heritage Award received by the late Lloyd Rodwell for his dedication and foresight in preserving the Lyell Gustin property. At the June 10 Ceremony, the Saskatchewan Architectural Heritage Association President's Special Award, given for outstanding heritage leadership, was presented to Peggy Sarjeant of Saskatoon. Among her many community contributions, Peggy has served on the Gustin/Trounce Heritage Committee for some two and a half years and has brought her extensive experience to the restoration and preservation of the Gustin and Trounce Houses. Congratulations, Peggy! Photos below are by Bill Gray, courtesy of the Saskatchewan Architectural Heritage Society. On Monday, August 21, Gustin House presented its third and last major recital of the Saskatoon Centennial series. Trio Colore performed works by Mozart, Beethoven and Dvorak for a large and warmly appreciative audience at Grace-Westminster United Church. Members of the trio are violinist Kerry DuWors of Brandon, MB; cellist Rachel Pomedli, currently of Nishinomiya, Japan; and pianist Erica Tang of New York City. 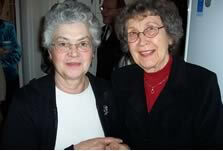 Ms. DuWors and Ms. Pomedli, both natives of Saskatoon, had studied piano with Gustin graduate, the late Sheila Shinkewski, to whom the concert was dedicated. Ms. Tang, originally of Edmonton, counts as one of her masterclass teachers the late Thelma Johannes-O¹Neill, also a graduate of the Lyell Gustin Piano Studios. Thank you to Trio Colore for the fine summer concert; and thank you to the volunteers, to those who contributed services, and to all donors to Gustin House! Continuing with festivities for the 250th anniversary of the birth of Wolfgang Amadeus Mozart, Gustin House presented a program "celebrating the luminous," even as the gathering darkness of late November brought reminders of the coming winter solstice. Dr. Robert Sider's talk, "Illuminations: Making Our World Bright," elaborated on themes of light in Greek mythology, classical philosophy, and the rituals of various traditions, which he illustrated with a collage of images and texts. The piano arrangement of Mozart's final symphony--No. 41, the "Jupiter"--was performed by Gillian Lyons, Karen Reynaud, Gregory Schulte and Karen Sterner, recalling the countless ensemble presentations which had taken place during many decades in the Gustin Studios. A reception concluded the evening. The pianists for Mozart's "Jupiter" Symphony, left to right: Karen Sterner, Gillian Lyons, Karen Reynaud and Gregory Schulte. Karen Sterner visits with the evening's speaker, Roberts Sider, and with LuraMae Sider. 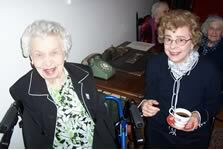 Marion Penna and Margaret Swan. Rulia Xu, Joan Halmo and Lynda Finnimore. In conversation, Lou Horlick, Ewan Coxworth and Robert Sider. Visiting university students from Germany, David and Juliana with Ilse Guenther. Hugh McKee, Joyce Pitzel and and Marlys Rivard hear Gregory Schutle's thoughts on art.